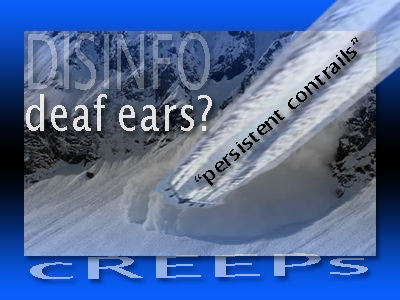 Is the Recent Avalanche of "Persistent Contrails" Disinfo Falling On Deaf Ears? Many of us may have heard by now how former governor Jesse Ventura flipped sides on the chemtrails issue, bringing globalist climate "scientist" Ken Caldeira on his 'Off the Grid' show to pronounce that chemtrails conspiracies are not real and all the destruction and disfigurement of our once blue skies is all due to "contrails" ice crystal formations. Ventura bowed at the alter of Caldeira and all his deep deception, accepting all his viscous lies, ignoring the pile of evidence that shows government has been tampering with geoengineering, and climate altering chemical engineering of our atmosphere (including the troposphere and stratosphere), and then accepting his blessings that chemtrails are silly conspiracies that should be ignored. Anyone concerned about our planet and anyone who has witnessed our skies turn from blue to white, would cringe at the sound of Ventura praising Caldeira: "You're an expert, I wanna believe your expertise..." said Ventura as Caldeira cracked a deceptive smile while looking down and to his left almost the whole time he was speaking, a classic physical sign to look for when someone is lying. But it's not just Ventura's unexpected pro-contrails disinformation segment that should concern truth seekers, it's the fact that many of these disinformation agents are popping up everywhere online. We already know that government is currently highly engaged in the information war, actively and aggressively attacking truth seekers with propaganda designed to demonize them. As I've mentioned before, we are entering the second phase of the three phases of truth (stage 1- Ridicule, stage 2- Violently oppose, stage 3- accept truth). In this second phase, truth seekers are being violently opposed. Face it, it's much more dangerous to love the truth, freedom, the Constitution and/or to be a liberty lover now than it was even just a few years ago. Standing for truth is getting more and more dangerous. We are all seeing a blue print for the cycles of life which is also nicely appreciated by glancing at history. These cycles of consciousness occur over and over again and actually define our existence. Part of these cycles of consciousness that humanity goes through, has a lot to do with our own struggles in which one part of humanity seeks to control and oppress the other. One of the tactics that the oppressive segment of humanity uses to implement this oppression on the other expression of humanity, is propaganda and lies. Without the tools of propaganda and lies the oppressive expression of humanity would not be functional and thus would not be able to oppress, steal, and destroy. There may be reason to believe however, that this recent avalanche of "persistent contrails" lies plowing through the internet may be falling on deaf ears. Consider this: Do you think it is possible to become un-awakened about chemtrails once you truly understand the arguments, the evidence, and the historic documents that support this intent? Can you really contain human consciousness outside of a few young minds who may temporarily be swayed (in this case by the "persistent contrails" argument) only to awaken later on as things get worse and more information and whistleblowers come out? I would venture to think no you cannot. Many people that I speak to who know about chemtrails tell me even before someone mentioned chemtrails to them the skies didn't look right to them. Sometimes you just look at something, and something in your gut tells you it's not right. This is the effect that graffiti of our skies often has on human consciousness, especially on those old enough to remember our once precious blue skies. What else are the globalist doing to push their geoengineering plans forward? This one caught me off guard but I noticed recently that a yahoo search for "image of blue skies" returned a link to a page full of images of "blue skies". Only something was wrong. You see, every image on this long page of images was an image of clouds in the sky. Many of them were chemtrails filled skies. Seems like there is a focused effort to eliminate the concept of blue skies out of the consciousness of the children and young adults. Suggestion to all. Keep safe and if possible digitize all of your old family photos with blue skies and show them to your kids and young adults. Preserve the images for future generations. They (the globalists) may someday want to kill for them as these images (of deep blue skies) hold the proof of what our skies used to look like. Remember that the war to push the persistent contrails myth is also a war against the notion of blue skies. As this now highly intense disinformation war continues about so-called persistent contrails that shoot out of ordinary planes exhaust, become ice crystals, then magically and automatically expand to massive clouds when it mixes with a waiting layer of silver iodide that happens to be in the troposphere and stratosphere. This incredible sequence of chemical events say the globalists "scientists" like Caldeira and the battalion of online contrails creeps, spell S.O.L for blue skies lovers, as they are (presumably) forced to succumb to the reality of this now most failed invention of all time (planes). Consider the contrails creeps logic, that the Wright brothers invented a flying vehicle that is now being blamed as the primary cause of the destruction of our planet including blocked sun light, weather alteration, drought and rain manipulator, death, thirst and starvation creator, planet equilibrium changer and ecosystem destroyer. All the crimes of the globalists are shockingly being blamed on the Wright brothers' basic fuel consumption mechanism. Something even George Orwell would not have predicted. Before we assume that the propaganda has worn itself out and will whither away in due time, let's be aware that propaganda is always in motion. It's a dynamic process not a stationary object. Propaganda finds ways to re-invent itself and re-inject itself into society. I believe once we see the propaganda and the technique and delivery used by the enemy, we defuse it once and for all, rendering it useless and helpless. This is our final goal and I firmly believe these waves of propaganda ultimately lead to further awakening and push us along our final destiny. With the natural energy inside of us all pulling us toward survival and expansion of consciousness, humanity as a whole is poised to reject these government messages that seek to keep us under oppression and steal the beauty of life from us, like the beautiful blue skies we once had. This stealing and oppression of humanity comes at a price and one of them is the awakening that comes with the worsening problem. Thus, I believe that if you tally up all the numbers we would find that the latest monsoon of "persistent contrails" disinformation is actually falling on deaf ears. I truly believe most people are waking up and they are sick and tired of the lies. Yes, they will continue to train new Ken Caldeira's of the world and promote them within the system so that they can reaffirm to us the same myths and confirm it with their "expertise". Yes, the cycle will go on, and yes the propaganda will never stop. But for now all is well and nothing much has changed except with every day more and more people are actually looking up and wondering what in the world is going on. Chemtrails awareness can be mentally fatiguing (literally and figuratively) so let us have the strength to stay aware and informed of what the opposition is doing and to stay both mentally and physically healthy until we get the chemtrails justice breakthrough we so desperately need.